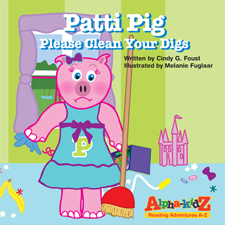 In this episode of Confetti Park Storytime, we hear Patti Pig, Please Clean Your Digs, narrated by the author, Cindy Foust, mastermind behind the Alpha-kidZ book series. Patti Pig, Please Clean Your Digs is the “P” book in the series, of course! Patti’s twin brother, Paul, doesn’t understand how they are so different. He is so neat and clean, and her room is, well—a pig pen! “I can’t help if I’m a little untidy,” pouts Patty. Anyway, who but Paul minds a little gum on the bed? I don’t have time to squabble with my brother. I need to plan my birthday party instead. When Paul funds out Patti is planning a slumber party for their birthday, he offers to help her clean her room. The twins learn a lesson about teamwork—and Patti learns that a clean room is worth the effort. Cindy Foust lives in West Monroe, Louisiana. She launched the Alpha-kidZ: Reading Adventures A-Z book series in 2003. Each letter of the alphabet gets a feature story and a feature creature who has an adventure. Austin Alligator, Elephant Emmy Lou, and Freddy Fox… these are some of the characters who face a challenge and find a solution. All of Cindy’s books offer lessons in character development and conflict resolution, told in engaging rhyme. And the books are brightly and colorfully illustrated (by different artists). Cindy says that personal experiences and inspiration from family and friends provided the basis for each of the stories.